On Tuesday, these young trees along North Albany Road looked as though it was fall. Some of the street trees planted along North Albany Road don’t look so hot these days. They seem to be suffering from drought and heat, and if they’re not already dead, the city is trying to keep them alive. 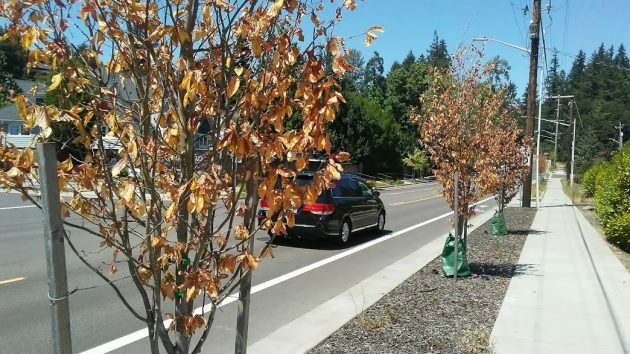 A reader called my attention to the sad state of many of the young trees, planted after North Albany Road was reconstructed in 2015 at a cost of $6.6 million. The subcontractors who plant trees as part of street projects normally guarantee them for a period of time. I wondered if this was the case here. Staci Belcastro, the city engineer, told me that the trees planted as part of this project are no longer covered by the project warranty. Speaking of dying trees, why are there so many dead and dying Douglas Fir trees in North Albany. I live on the corner of Sparks and Scenic and can count more than twenty. Hello Jan my name is Chris and im currently training to become a arborist. In my opinion with out directly seeing the fir trees would be bore beetles unfortunately the only way to treat a tree infected with them is to WATER WATER WATER when you think you have watered them enough WATER them again. The easiest way to tell if you have them is to look for tine holes (way smaller then a wood pecker would leave) in the bark. If bore beetles are to blame a general rule of thumb is 5 holes per foot of tree any more its almost guaranteed to die unfortunately. With our super mild winters and increasing summers the bugs have not died off like they normally would instead there reproducing like crazy and killing all the trees. Corvallis is under attack by birch beetles a great portion of the birch trees in Corvallis are infected. The trees along North Albany Road may no longer be on warranty, but what about the ones on Crocker, just South of Valley View. These were put in as part of the reconstruction of Crocker. Many look like they are already toast. No water bags for Crocker’s new trees – which I would hope are still on warranty. The trees on Crocker have a piece of pipe buried in the ground next to their trunks. I assume it is there for watering near the roots. I saw someone on an ATV with a large water tank pouring water into the pipes last week, and wondered who was paying for the watering. Unfortunately, it may be too little, too late for some of those trees as well. I live just off North Albany Road. I, too, noticed the stressed trees. The reservoir bags were just added, and it may be too late for some of the trees. Ahh, too little too late. i have not noticed those watering bags on the trees earlier in the summer. A lot of the trees will probably die. Too far from downtown for tender loving care, I guess. In my opinion, N Albany is not the place for beautification like that anyway. The fir trees dying? The Willamette Valley has been in a “drought”( or reduced rain/water) for a number of years. Fir trees are not native to the valley, so they are dying because of lack of water they need. They thrive in the coast range and the Cascade foot hills. My comments were about the trees on Crocker, not N Albany road. Sorry. The trees in pic are not fir trees. The water bags have been used it this area for years–understanding the issue. Why bags were delayed this year seems to be an administrative lapse. “Young trees throughout the city are struggling with this hot weather. “Jan Filley – Asks about dead and dying Douglas Firs in North Albany. Chris’s response is correct in his/her response. We have had a number of unusual weather years lately and have run across a fair amount of Douglas Fir’s damaged by beetles. They are naturally occurring but become a larger problem when trees are stressed. “Ken Horvath – Crocker Lane trees are under warranty. The contractor has tubes to water the roots on those. Typically we like the bags better but both work. I saw the contractor watering them last week so I know they are aware of the need to keep water on them. When the trees live, the City can’t seem to keep the branches trimmed back from the bike lanes, such as the Oak street “improvement” by Lowes between 9th & Queen. This is a bad stretch since vehicles can’t seem to stay out of the bike lanes because they try to drive straight and the road isn’t.